MARION is a 2012 AMA Houston Crystal Awards Finalist for Best B2C Website! This week MARION Marketing was informed that we are finalists in the 2012 American Marketing Association Houston Crystal Awards for Best Business-to-Consumer Website! 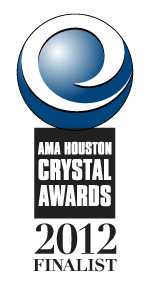 The Crystal Awards is AMA Houston’s premier event, honoring Houston’s best marketing work. We are very honored to be a finalist and we hope we win in the Best B2C Website Design category! The awards gala will be held on May 17, 2012 at 6:00 p.m. at the Hyatt Regency in downtown Houston. The finalists’ entries will be on display followed by a seated dinner and program when the winners are announced. The MARION marketing firm worked really hard on getting the entries to perfection. Until then, we will keep our fingers crossed!